"What made the civil rights movement of the sixties different from earlier phases of the struggle was that it took place under the glare of the most extensive news coverage the world had ever known. When a civil rights leader was injured or killed, it was not simply whispered -- it was front-page headlines. People who resorted to violence found themselves on front pages and on the evening news. What's more, it was violence that by now most people, white and black, North and South, did not think was right. The media coverage also prompted more and more people to participate in the movement. Busloads of students, clergy, workers, and housewives joined new sit-ins, not only at lunch counters but in bus terminals and other public areas." Myers, Walter Dean. Now is Your Time! : The African-American Struggle for Freedom. New York: Scholastic, 1991. Print. 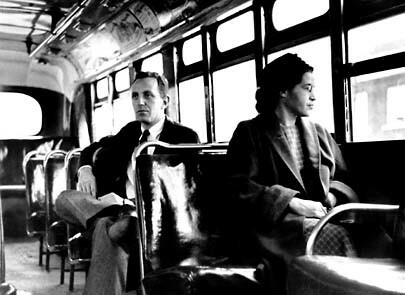 "Rosa Parks at the front of a bus." Photos/Illustrations. Library of Congress. American History. ABC-CLIO, 2014. Web. 15 Nov. 2014. We have recently studied two famous speeches by Americans who held a strong belief in equal rights for all Americans without exception. The Civil Rights Movement was shaped by many remarkable people and events. One of these people or events will be the topic of your research paper. Write a 2-3 page research paper that examines the impact your assigned subject had on the Civil Rights Movement. Cite information within your essay from a minimum of three sources. List your sources on a separate page titled "Bibliography." Use proper MLA formatting and citations. 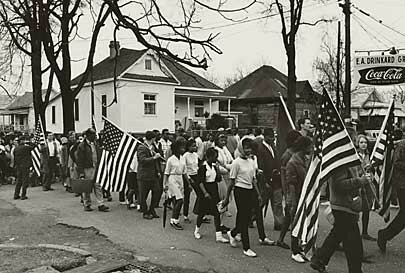 "March from Selma to Montgomery, Alabama." Photos/Illustrations. Library of Congress. American History. ABC-CLIO, 2014. Web. 15 Nov. 2014. Check the table of contents and the index for your topic. Use the title page and the versa page (back of title page) to find information for your citations. Since all students will be sharing the same print resources, these books will only be used at school. Use the Do What chart, note-taking pages, and the TIDE guide as your research and plan your paper. Your teacher will share these with you in class.